Dr. Barry Glaser of Glaser Orthodontics near Peekskill, NY has some tips to help patients distinguish between a dentist and an orthodontist. The difference between an orthodontist and a dentist may be indistinguishable to some people. Something that many folks don’t know is that all orthodontists can be dentists, but not all dentists can be orthodontists. They are both certified oral health care professionals, both treat and maintain the health of your teeth and gums, and both have the education and experience to be called doctors. In these areas, they are pretty comparable. However, there are more differences than similarities. All orthodontists require further schooling and more experience in their specialty (orthodontics) beyond their dental school training. A similar example would be if a medical doctor elects to take special training to become a surgeon. So, if a dentist has a patient with a dental malocclusion, they will refer them to an orthodontist for treatment. Traditional braces, Invisalign clear aligners, and other corrective treatments are methods an orthodontist might use to treat these issues. 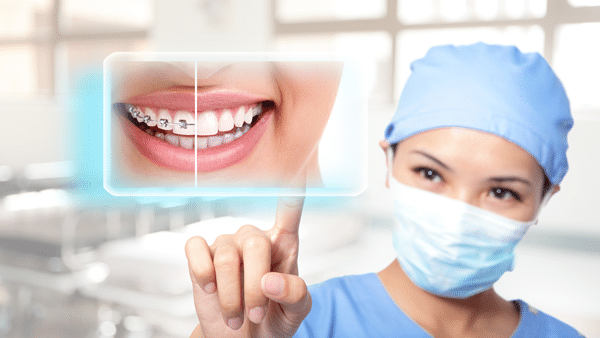 Orthodontists help with crooked teeth, underbites and overbites, crossbites, spaces between teeth, overcrowded teeth, and the effective treatment of temporomandibular joint (TMJ) disorders. An orthodontist should be consulted for other jaw issues as well. While your dentist may be qualified to offer their patients fillings, TMJ treatments, and other orthodontic care, putting your smile in the hands of a qualified professional orthodontist can help a patient to experience better treatment outcomes.